Just before the sun disappears to end another day over George Lake in Killarney Provincial Park in Ontario, Canada, the lighting reflects across the surface of the lake to the banks on the opposite side. George Lake is a unique region of Ontario, Canada as the shores are decorated with ancient smoothed rocks typical of the Canadian Shield. The hillsides across George Lake are all part of the stunning scenery, ones which were created hundreds of years ago by glaciers. With the campground being very secluded, George Lake offers visitors serenity, amazing scenery and sunsets which are hard to beat along with water activities such as swimming, kayaking, canoeing and fishing. 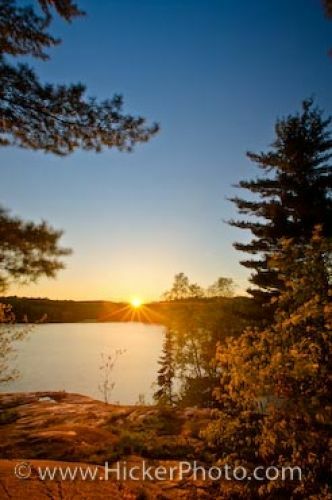 Picture of the sunset scenery of George Lake in Killarney Provincial Park in Ontario, Canada. ... Here people will find the true nature of Killarney Provincial Park and the beauty of its surroundings.